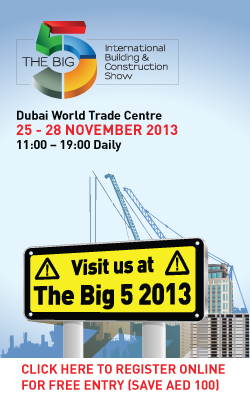 STRUMIS LTD is delighted to participate at The Big 5, the International Building and Construction Show from 25-28 November, 2013, Dubai, UAE. The Big 5 is the Middle East’s largest construction exhibition. In Its unique venue, this exhibition is a way to source new and innovative products and provides the widest and most comprehensive range of building and construction products. An international exhibition, Big 5 is designed to attract a wide audience including; construction contractors, engineers and architects. This year there will be hundreds of seminars which you can attend for FREE! STRUMIS LTD welcomes any delegate registered/attending The Big 5 to visit our sales representatives on stand number 2B77, where we will be demonstrating our solutions for efficient steel fabrication and construction management. Delegates visiting our stand will witness new initiatives for steel fabrication and also new enhancements with our products. You will also experience and see some of the new features in our upcoming V9 of our Steel Fabrication Management and Information System – STRUMIS. So come along to The Big 5 show where our Middle East team will be there showcasing our STRUMIS system for larger and medium sized steelwork contractors, together with our Essentials solution for smaller fabrication shops. We will also be demonstrating our Building Information Modeling (BIM) collaboration software - BIMReview, and introducing BIMProject - our construction lifecycle management software for procurement and construction teams. STRUMIS LTD, along with its Steel Fabrication Management Information System – STRUMIS, is delighted to announce their dedicated seminar session at The Big 5 titled - BIM for Steel Fabrication. Delegates who have registered to attend The Big 5 can come and attend this FREE seminar to understand new initiatives from STRUMIS LTD for Steel Fabrication. 28th November 2013, at 14:30 – 15:00PM, theatre No. 1. Seminar theatres will be located in Makhtoum Hall on the exhibition floor. Simply attend this seminar at the above time and date or visit our stand (2B77) for more details. Prize draw will take place on Thursday, 28th after our seminar at 3pm local time. *terms and conditions apply. Licence will be given after the show via email.